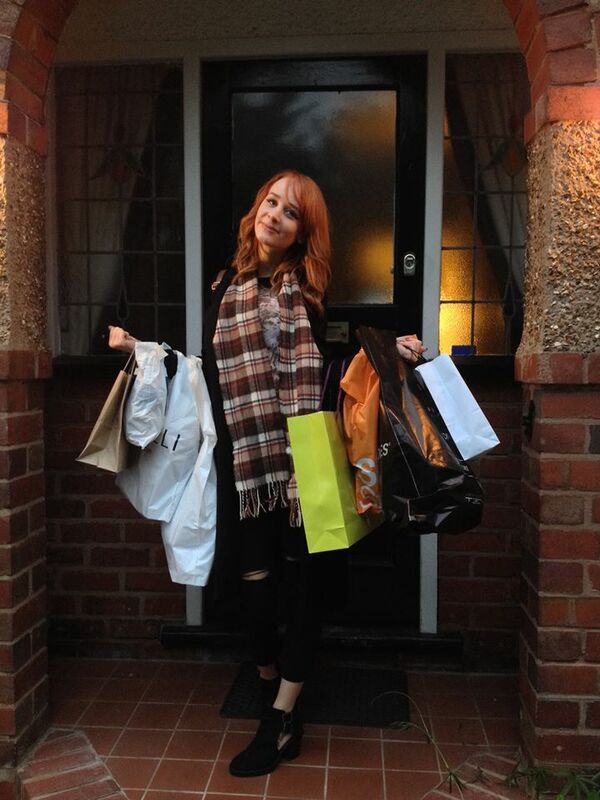 Cheshire Oaks Designer Shopping Haul!... - Sleek For Yourself! 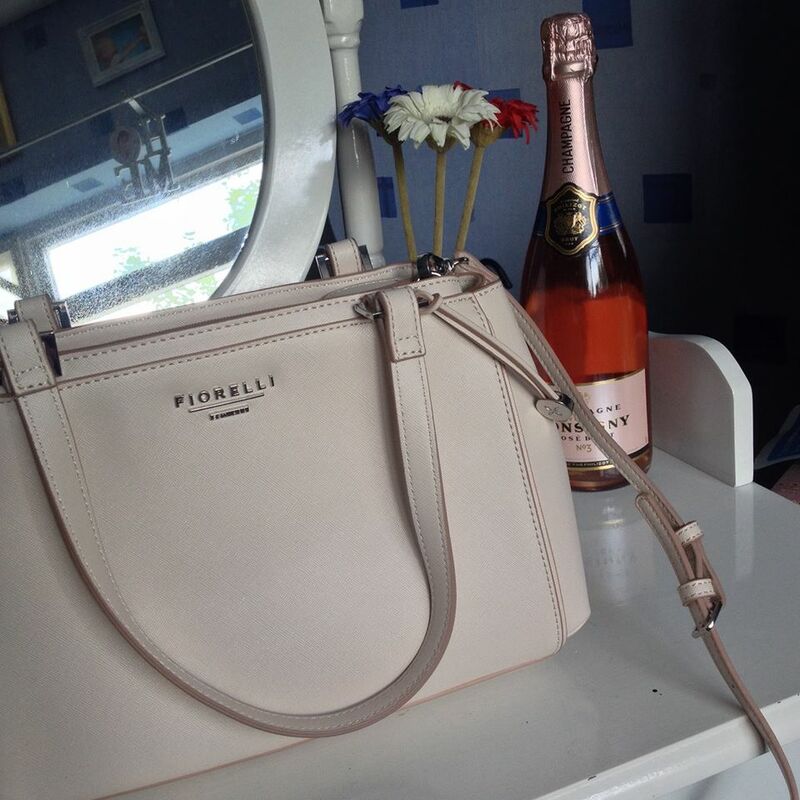 Cheshire Oaks Designer Shopping Haul!... | Sleek For Yourself! I've had such a fantastic week! I've had a well deserved week off work and I've loved every minute of it! Now that I finally have time to sit down and write a post I'll start off by writing about my amazing trip to Cheshire Oaks Designer Outlet. Now I'm not sure if everyone knows what it is, I hadn't heard of it myself until recently. But when I discovered that all of the shops there were designer brands, I didn't take much convincing to go! Cheshire Oaks is located just outside of Ellesmere Port which is North of Chester. All of the clothes they sell are 100% genuine designer items, and the shops themselves are set out like the regular everyday shops you would find in shopping centres and high streets. The best part is, Everything is discounted! I would definitely recommend having a look if ever you find yourself nearby. It makes for a lovely day out and you can really find some amazing bargains which I'll be sharing with you all now! I managed to get some beautiful new purchases and I have been dying to show you all so lets get started! This is me looking very happy with myself because I've just got home and have lots of pretty things to look through. Ooh it's just like Christmas! Which is only 146 more sleeps away, MAY I ADD! But yes... They are SO pretty aren't they?? Then there is the necklace... This is supposed to be a choker, but because I'm so petite it just dangles off me, but I really like it anyway. I'm loving dream-catcher themed things lately! 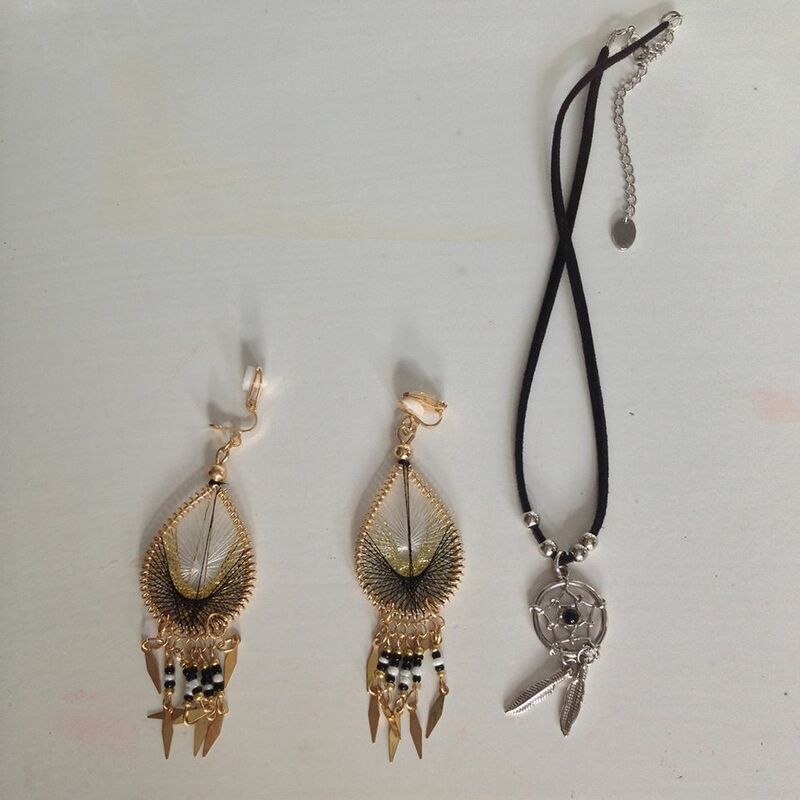 The earrings were meant to be £5 and the necklace was meant to be £5.50 but with the 30% reduction it came to a total of £7.35! Bargain! Next up..My new Fiorelli Handbag! I LOVED this as soon as I saw it, It's a very light baby pink, so I will have to be super careful not to mark it and it feels like such a "Grown Up" bag! It makes me feel like I should be a mother because it has so many compartments, you know how mums tend to have that? Or am I making that up? 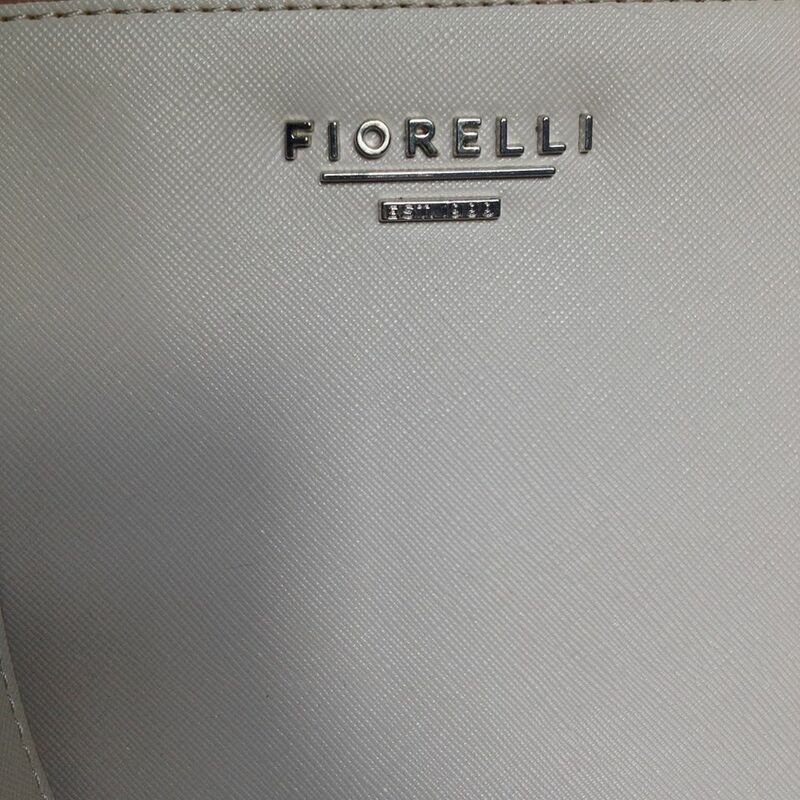 This bag is a lovely neutral colour so will go with most outfits, which is always a bonus. 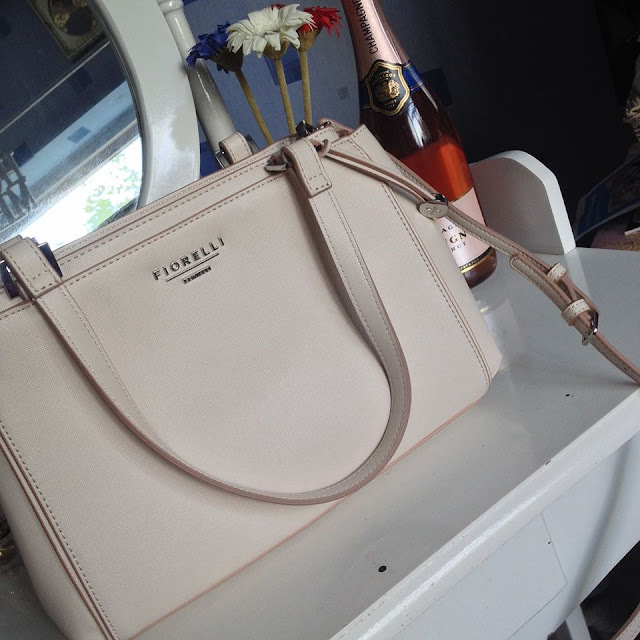 Better yet it was meant to be £60 but in the Fiorelli store everything is discounted so it was already 40% off which is an amazing price. HOWEVER, this had an EXTRA 20% discount! Absolute madness. Altogether this made it £28.80! I was in disbelief, so obviously I snapped it right up and I am extremely happy with this find. 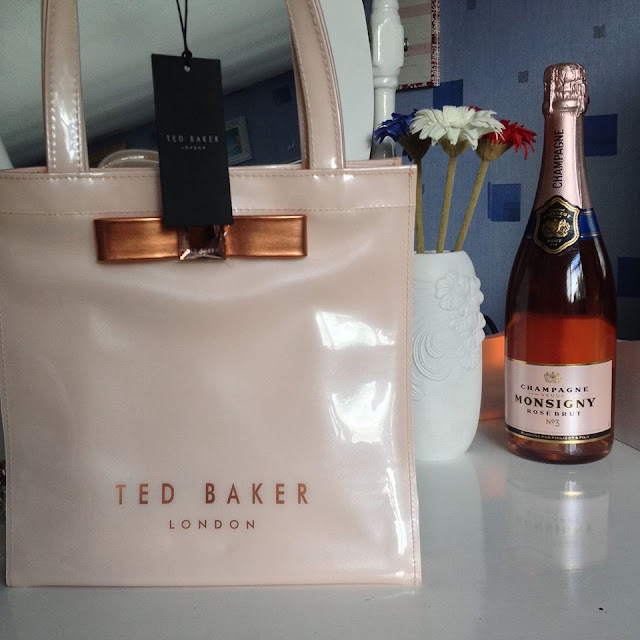 My Ted Baker Tote Bag! 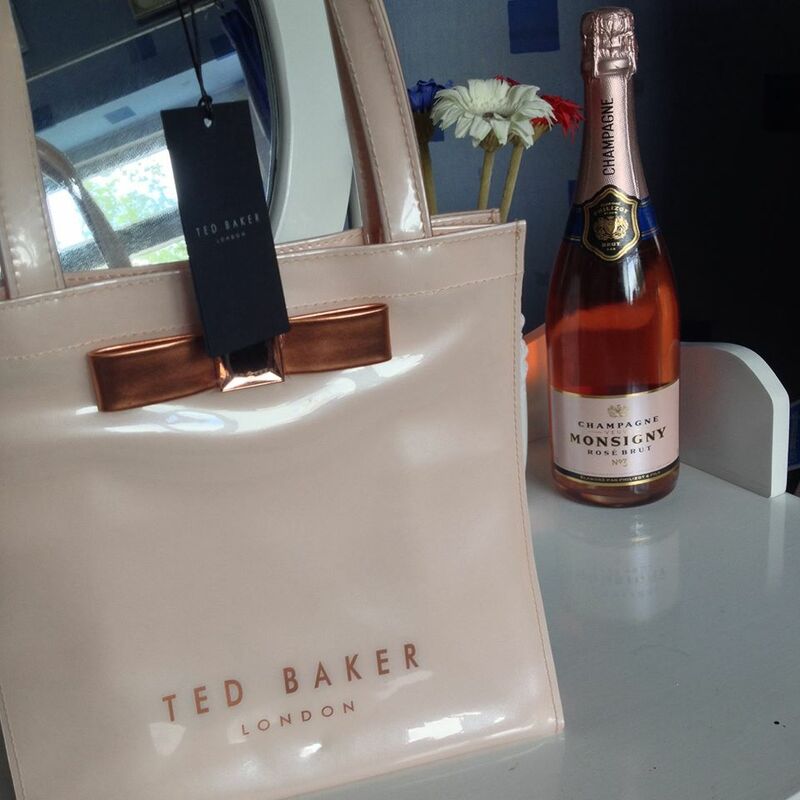 Now, I had already decided that when I went to the Ted Baker at Cheshire Oaks that I would not be leaving without one of these bags. I had seen them on the Diffusion website priced at £24 which I thought was a great price. The downside was that they only had the blue one and even though it was a lovely colour I wanted to see what Cheshire Oaks had to offer, so I waited patiently and I'm glad I did. I saw this one and was drawn to the bronze bow. And better yet it came with the matching makeup bag! The handbag was £23 which is a whole pound cheaper than Diffusion (every little helps) and the makeup bag was £12. A total of £35 for both? Brilliant! There was also a much wider range of colour at Cheshire Oaks, so many to choose from! I always find myself buying brown bags though, so I thought I'd go for something different. Today was a day of pastel colours. I took them both to the till, happy with my findings, the cashier swapped the display handbag and makeup bags with pre-packaged ones from behind the till, which I thought was extra nice of them. It wasn't until I got home that I noticed the makeup bag that was swapped was not the right one! It was a different font, colour and it didn't have the matching bronze bow, even though it was nice and was very similar I decided to give them a call (and by give them a call I mean, make my boyfriend call them). They were extremely polite and helpful and explained that if I posted the wrong makeup bag back to them they would send me back the right one AND refund all postage costs, which I was very happy about so I am currently waiting for my makeup bag in the post! I'll be updating the pictures once it arrives so I can show you all! My opinion on the Ted Baker store at Cheshire Oaks was not soured at all due to how friendly and efficiently they dealt with it. 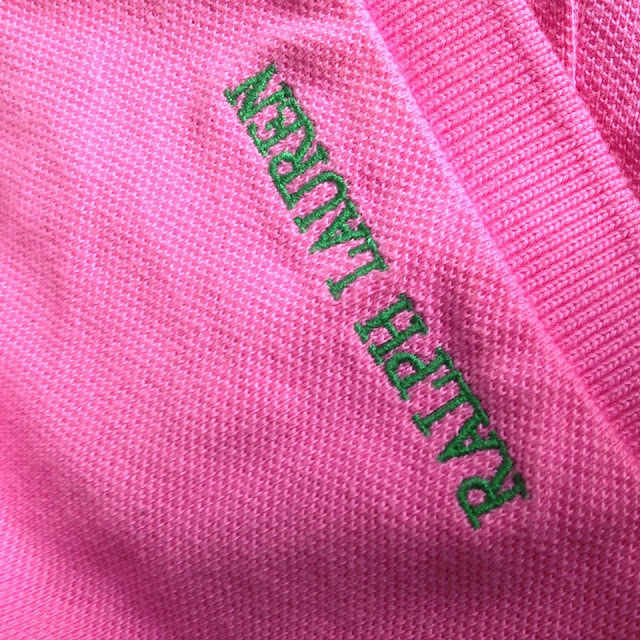 My Ralph Lauren Polo! I do believe this was probably my biggest bargain of the day. I knew as soon as I went into Ralph Lauren that I wanted one of the iconic polo shirts. I think they look so classy yet comfortable and effortless. This one was priced at £79.99 when first released, then Ralph Lauren reduced the price to £49.99. However at Cheshire Oaks they were retailed at £16.99! The only thing that I didn't realise until I got home and tried it on was that there aren't any buttons on the front, but because it was such a nice fit I really didn't mind. I love the colour since I don't have any pink clothes, especially not bright pink but I wanted to be confident and try new things ! My trip to The Body Shop was a good one! There was a deal on the miniatures. If you bought two you got 20% off, if you bought three items you got 30% off and so on... 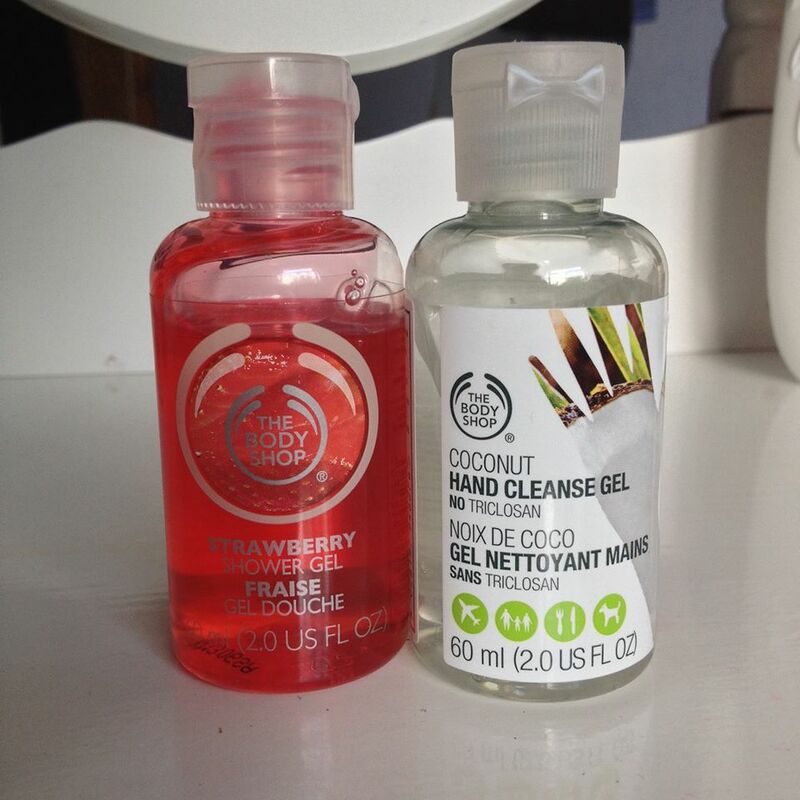 I only saw two items that I wanted to try, and since I don't usually buy from The Body Shop I have definitely been converted! The strawberry shower gel is the definition of heaven, it's so fruity you just want to eat your own legs off, it lathers really well too. The coconut antibacterial hand gel is AMAZING! Now I'm a big fan of antibac and I love finding one that smells clean and refreshing. When I first used this it reminded me of Malibu, I didn't think about the fact that it's a coconut scent mixed with an alcohol based product, but once it has settled in and the alcohol scent wears off you're in the clear! HOWEVER the coconut scent stays all day and I mean ALL DAY. It's a miracle product! Very long lasting indeed! They were both £2 each however with the 20% off I got both for £3.20. 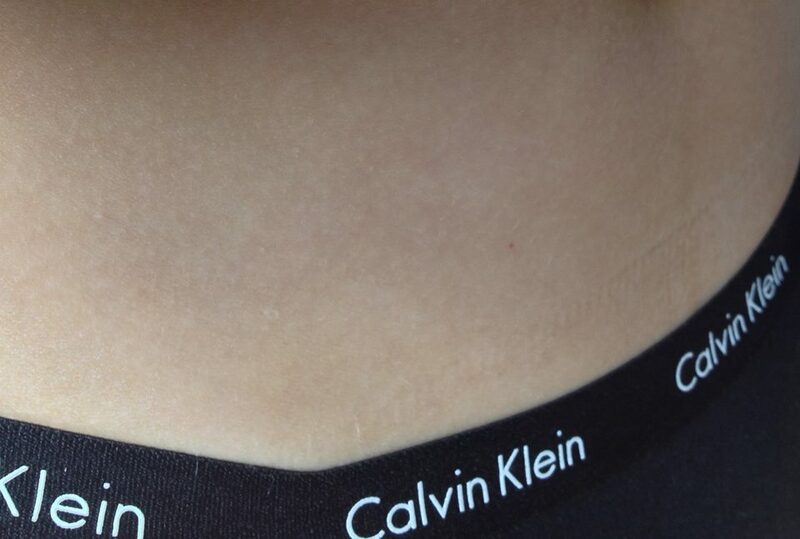 Calvin Klein Underwear. It was hard to get a good picture of my pants as I didn't want to really pose around in my undies, so this picture of the waistband shall do! I had every intention of buying some Calvin Klein Underwear from Cheshire Oaks as I had being longing for some for a quite a while! However when I got there I was rather disappointed. This was the shop I had been most excited to go in but there was hardly any selection at all! I knew I wanted the Classic Calvin Klein waistband but there wasn't any matching bras. There was only black or white and they only had Medium and Large sizes! But luckily I managed to find one thong in black which was a small. I would have preferred them in white boxers but I did still like the thong so I bought it anyway for £8 down from £18. Whilst at the till I inquired about a matching bra, the lady serving me explained they had been discontinued, however in September they will be bringing out the thicker waistband sets which I was originally after, so that was nice to find out. Looks like an excuse to return! Last but not least! This is a terrible picture of my hoodie but it's so hard to get a pretty picture of slouchy chill out clothes. This is the most comfortable hoodie I have ever bought! 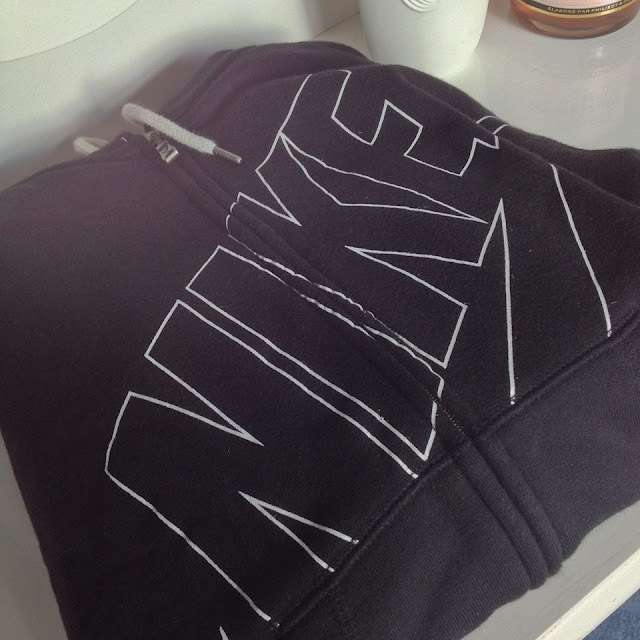 I'm not usually one for sporty brands at all and I very rarely wear hoodies or casual clothing like this so I was not expecting it to suit me, but when I put it on I thought it fit wonderfully. Something you can just throw on over anything and I fell in love. It had been reduced from £50 to £35 so I snapped it up quick before anyone else grabbed it. It's lovely and thick to without been too 'fleecy'! The Nike store here was superb, my boyfriend snatched up some nice new running gear for a fantastic price, it definitely gets my seal of approval! 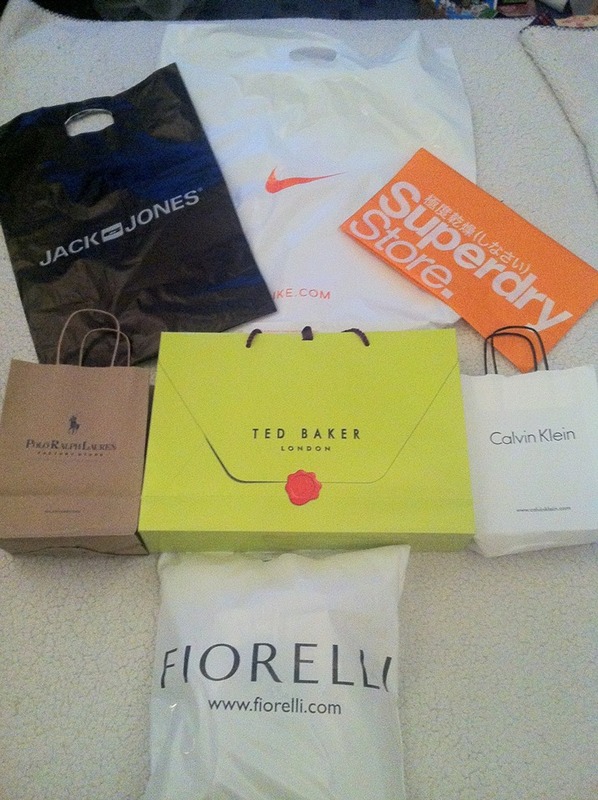 All together I spent under £150 at Cheshire Oaks which I really cannot complain about. After all, that was for Two handbags, a makeup bag, a hoodie, a pair of earrings, a necklace, some hand gel, some shower gel, some pants and a top! All great brands too! Thanks for reading guys! I'll be popping the link to The Cheshire Oaks website below so you can all have a nosie! I'll also be blogging about my week off when I next get chance, it's been amazing!